Su-35 fighters deployed to Syria 5 out of 5 based on 13 ratings. 13 user reviews. Russia deployed a flight of four of its latest Generation 4++ Su-35 fighters, according to the Voyennyy Informator agency. The Su-35 deployment followed Turkey’s accusations that Russia violated its airspace. The Su-35 flight include aircraft with fuselage numbers 03, 04, 05 (RF-95815) and 06 (RF-95816). The first two of the four were delivered to Russia’s Aerospace Forces in late October 2015, the second two in early November. Russian designers and plots carried out all the necessary tests of the new aircraft. Unlike its Su-35 predecessor, the Su-35S has a number of advantages over 4+ generation fighters. It is the fastest fighter in the world, with top speed of 2400km/hr, with the most resilient airframe, and thanks to improved aerodynamics it can carry out the “pancake maneuver”, or a 360-degree turn without loss of speed. J.Hawk’s Comments: These four aircraft, unlike the multirole Su-30SM which have been active in carrying out airstrikes, were likely sent to Syria with only one mission in mind–to intercept and shoot Turkish aircraft should they venture into Syria’s airspace. 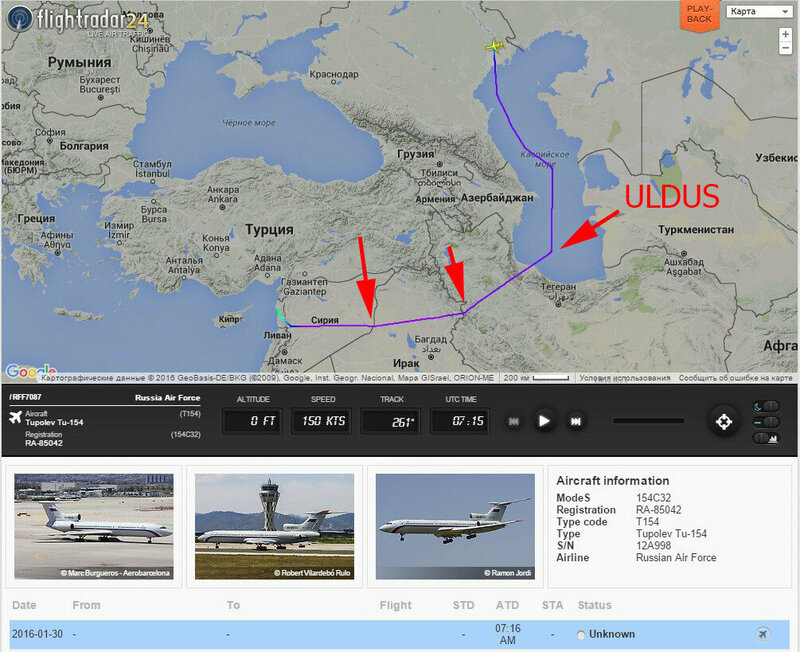 The Su-35s flew to Syria accompanied by a Tu-154M, from which the photos of the fighters were taken, and which followed the route indicated below. The Russians are getting serious. Wonder how Turkish aircraft will cope with jamming? It’ll be interesting although scary. All it takes is a miscalculation by either party. One would assume that as a NATO partner they’d have the latest EW equipment. So a test to see who’s tech is better I suppose. Perhaps the Russian tech being deployed here, is mainly 5th gen? Not sure Turkey’s is, but, I don’t have any special knowledge. US doesn’t trust Turkey with high tech weapons. For example; Turkey has been asking for Patriot sam system for a long time and the closest they got to it was a temporary deployment of the older PAC-2 version by the Germans. They withdrew it last year. Greece on the other hand has both a US PAC-3 and a Russian S-300PMU. I hope that’s true, Turkey has shown they aren’t trustworthy IMO. Wish NATO countries had this attitude with the KSA & other gulf countries. A squadron of these must be able to swisscheeze a regiment of F16s after all BVR’s are hits. It is no coincidence we’ve never heared of a phenomenon called “Turkish ballet”. The Turkish terrorists are gonna get what they deserve. Such beauties but dont be fooled.